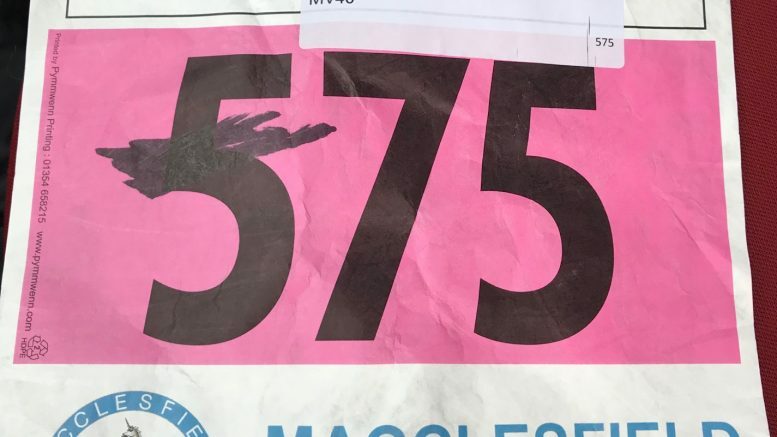 The Langley 7 was an annual race organised by Macclesfield Harriers as a fund-raiser for a local charity, the Rossendale Trust. I’ve done the race annually since 2015. It started in the centre of Langley Village and consisted of a run to the bottom of the village before turning almost back on itself along Hollins Lane to take in the climb of Withenshaw Lane. Indeed the race had a strap-line of there being ‘only one hill’. 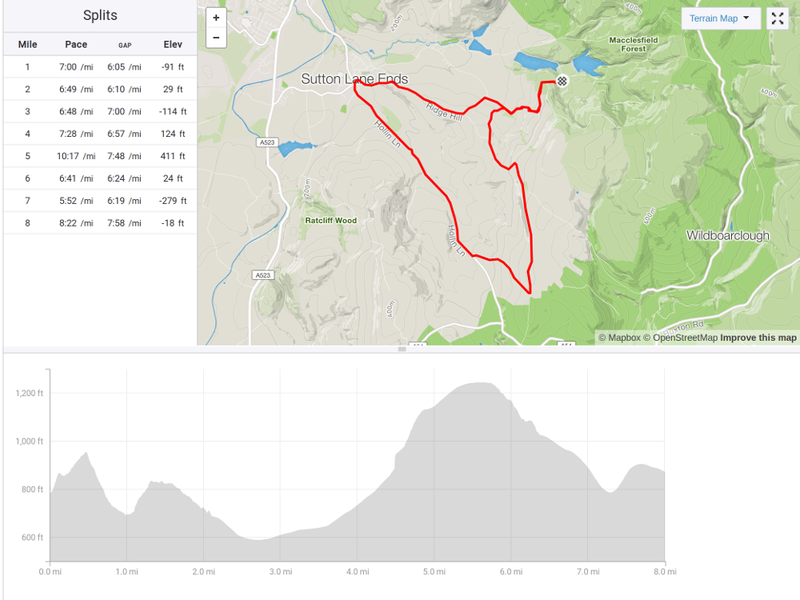 Once on top it was a rapid downhill back to the finish at the reservoir slightly out of the village. Then a brisk walk to indulge in cakes and hot drinks. All for charity. Last year, there was a cloud hanging over the event. 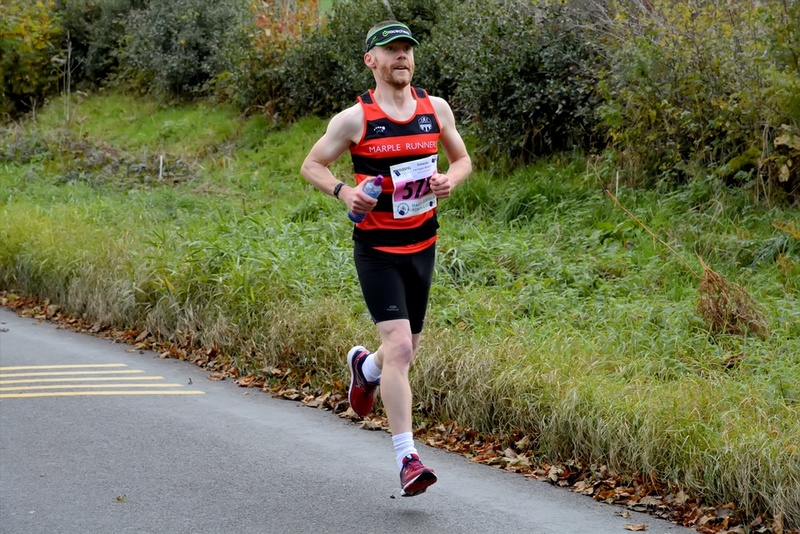 Langley is a tiny village and accommodating several hundred runners was always a challenge. Conveniently there was an industrial estate just outside of the village centre where everyone could park. However the site had just been sold to a housing developer meaning that this crucial facility would be no more. it had grown into being ‘a little bit more than 7 miles’. 8 miles in fact. some more hills had been added. Because you can’t have too many hills in a race, right? So not much change then! The new Race HQ and start/finish were at the ranger station in Macclesfield Forest. This was at the roughly 6 mile mark of the old course. Number pick-up was quick and easy and parking was well managed despite the relative lack of space. The organisers restricted the race size to accommodate this and emphasised the need to car-share where possible. Cakes were already on display ready for the finish. Always a nice persuader! At the start line there was the usual safety announcements, but also a minute’s silence in respect of the death of a local runner in an accident a couple of weeks ago. Following this, the starting gun (yes a real one!) was fired and 235 runners were off to explore the new route. Here’s the usual Strava trace showing the new route. Note that it’s over 8 miles now in length and, as promised, doesn’t feature Langley. Unlike the old course, the new route immediately went up-hill. In fact it was the reverse of the old rapid descent out of the forest. It was narrow but with enough room for people to get going. It was steep so that seemed to put off too many people from a heroic start, aside from the speedsters at the front. Half a mile later and it was time for a rapid descent by which time there was plenty of space around me. A few places changed hands but that first climb seemed to do a pretty good job of separating the field! No sooner had we gone downhill, there was a cheeky hilly before a longer and steadier descent. This road was one that passed to the south of Langley village and into the neighbouring village of Sutton where it picked up the old route (Hollins Lane) and the long hill. On the old route this was after about a mile of downhill from the start. The problem in 2018 was that we’d already done 2.5 miles of running with two definite hills tackled already. As such, there wasn’t quite the same bunched-ness of runners going quickly. Which in fairness wasn’t a bad thing; the event is on open roads and whilst a quiet road, there was more traffic on this stretch than any other. So having everyone strung out made it safer for all. It was definitely the impact of the new start, but this section seemed longer than in previous years. Having passed a water station outside the Rossendale Trust building it’s a gradual incline for about half a mile before the gradient increases. By the point we turned off the main road onto Withenshaw Lane I was struggling with my running. Withenshaw Lane is one that steadily gets steeper and whilst about 3 people overtook me, they soon started walking up ahead of me. But all things must come to an end, and the top of the hill does have fabulous views. And a road leading in front heading downhill. Hooray for road downhill sections; I’m a lot better at them than the uphill ones! In fact within half a mile I’d re-overtaken 2 of those that passed me on the uphill. So that was good. I was settling into the route which I remembered was downhill, then a bit undulating, and then very downhill. So when we turned left and onto a different road, my game plan was put back into the box. As it happened we were still going downhill, so the miles were flying by. The 6 mile marker suggesting we were getting towards the end of the race and the onset of cake consumption. A right turn and more downhill. Things were looking good, but I was aware there was a sting in the tail of this new course. Passing the 7 mile marker the rumours of a big final hill came true. In fact it was the reverse of the first of the downhills at the beginning of the race. And it was steep. The legs protested a lot and progress was slow. After an age (half a mile) two cheery marshals were shouting that this was the top of the hill and it was downhill here on in. And it very much was downhill. It was the reserve of the initial climb of the race and one I knew well. I was running quickly, but then again so was the runner in front I was trying to catch! I did close the gap, but couldn’t quite do it. The very end of the race had a 90 degree right turn into a funnel which was challenging coming in at speed. 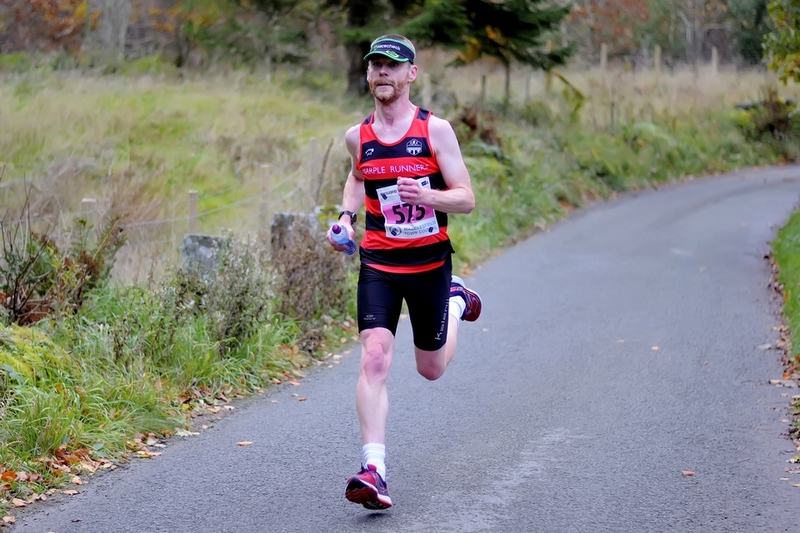 And probably fortunate that I hadn’t passed that other runner as we’d have probably collided at this point! So I had to settle for 38th position with a time of 59:19, 1 second behind 37th place. At the finish there was water, but back to HQ for tea and the aforementioned cakes, which were being provided for on a donation basis. 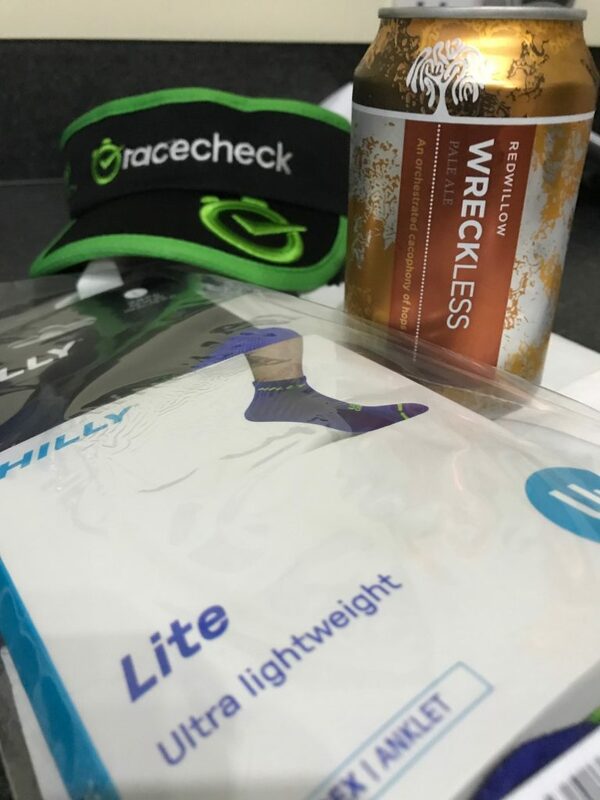 In addition, all finishers came away with a pair of Hilly socks and the choice of a can of beer or coke. The cost of the event was £12.50 (including transaction chargers) so I feel represented good value for money. Especially as the profits were being donated to charity rather than lining corporate bank accounts. And with free photos taken by the fabulous Bryan Dale, there’s a lot to like about the Langley 7. Following on from cakes – socks and beer! The Langley 7 has continued in triumphant fashion. The new course is significantly tougher than it’s previous incarnation, but for me, that’s just another reason to do it. 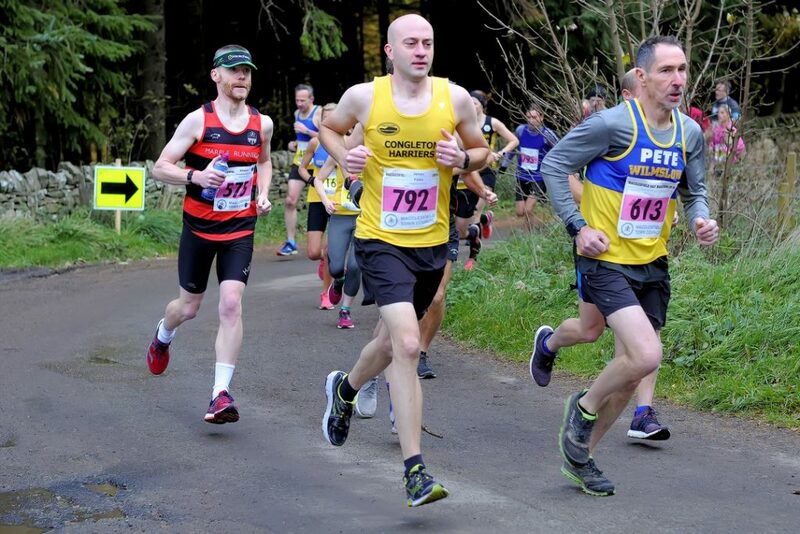 In the world of road-running, we seem to be neck-deep in flat & fast courses. Clearly that’s what a lot of runners are after, but there really is more to running than chasing PBs. Tough courses generally hurt at the time (if you do them right) but have an after-glow of achievement once the race stops. Yes, I’d have loved to have romped up all the hills today, but I clearly still have work to do on my fitness. I personally hope they stick with the name too; growing up in a world with Blake’s 7 (without Blake) and several iterations of Taggart long after the original star (and character) had passed demonstrates a name is just that. It’s quirky, although they would need a big note advising the distance isn’t 7 of anything; miles, kilometers or hills! And yes, it’s more than likely I’ll be back for more in 2019. Be the first to comment on "The New Langley 7 – Race Review"